NEUSPEED Pedal Set - Billet VOLKSWAGEN - Dezod Motorsports Inc - Home of the automotive performance enthusiast since 2002. 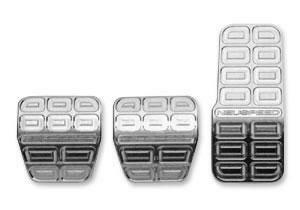 NEUSPEED’s full billet aluminum pedal set is made from a solid block of 6061 T6 aluminum. NEUSPEED’s special no-slip pattern ensures that your shoes stay stuck to the pedal on every shift. Plus they bolt into place, so you don’t have to worry about flimsy brackets falling off or crooked pedal covers. Manual transmission pedal set – Includes gas, brake and clutch pedals.